To appreciate the great work of Redemption and the privilege of a Kohenim service before Him. For a day in your courts is better than a thousand. I would rather be a doorkeeper in the Beit Elohai, Than to dwell in the tents of wickedness. Hiram king of Tzor was a Goyim king. He controlled vast timber resources in Lebanon. He was a very friendly to King David and now when it was time for Shlomo to build the temple he wished to show the same friendliness to Shlomo. He provide the timbers. 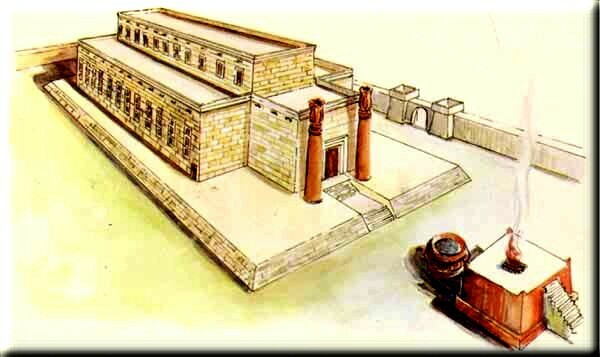 A Heikhal is the kadosh or sacred dwelting place (Set Apart place or Holy sanctuary where the table of shewbread, Menorah, golden incense Altar located and the Holy of Holies or Kadosh Kedoshim which consist of Ark of the Covenant. Yochanan 10:22 And it was at Yerushalayim Hannukah (feast of dedication), and it was winter. Yochanan 10:23 And Yeshua (ישוע) walked in the Beit Ha Mikdash in ulam (porch) Shlomo. Ye also, as living stones, are built up a spiritual house, an set apart kehunah (priesthood), to offer up spiritual sacrifices, acceptable to Elohim by Yeshua (ישוע) Moshiach. Divrei Ha Yamim Bet 2: 1-18 : Shlomo asks Huram to help building the Mikdash. station, permanant, a type of "Kehilla" (Assembly) which is in His body, the fulness of Yeshua that filled all in all (Eph 1:22,23) The Kehilla (Assembly) is a "spiritual house built of living stones (refer 1 Peter 2:5, Eph 2:20-22). The Temple face EAST to the sun rising. 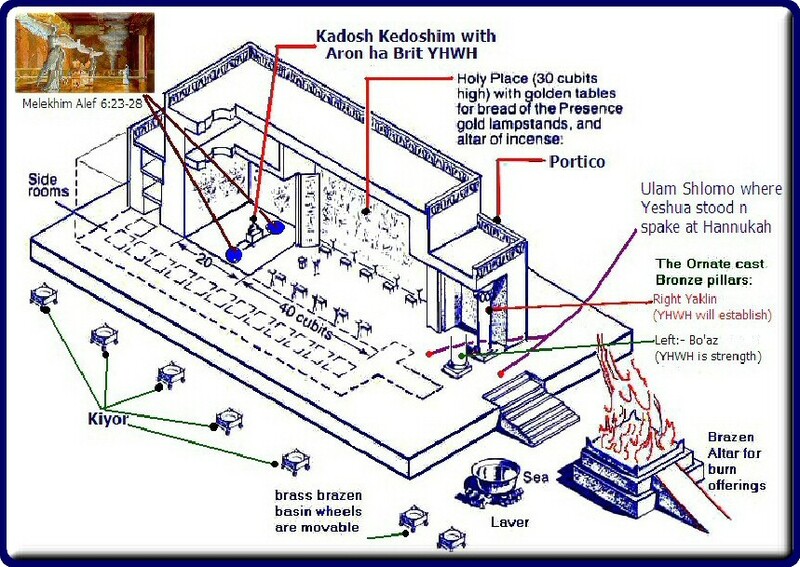 YHWH required this for the Tabernacle too. Colour of the temple Blue, Purple, crimson (fruitfulness giving a link with the Kehilla. speaks of suffering Moshiach, Silver is the metal associated with Redemption and riches of YHWH's grace. "great stones, costly stones hewed stones to lay the foundation of the house" In Ephesian 2:20 tells us of the Kehilla (Assembly) "built upon the foundation of the Tamidim and Prophets Moshiach Yeshua himself is the chief cornerstone"
speak of adornment refer Titus 2:10 "adorn the doctrine of Elohim our Moshiach in all things"
Along both the north & south sides of the Mikdash building were rooms to house the Levites who worked in the Mikdash, opened the great doors, etc. The ground level rooms were used as storerooms and treasuries. The chambers were 3 stories high, with 15 rooms on each level, giving a total of 90 rooms. The chambers became larger as one ascended the levels by a winding staircase, being 5 cubits square, then 6 cubits and the top level 7 cubits. The great stones were cut and prepared in the quarry deep beneath the city. Prepared in a quietness which was unique to such a task and speaking of the quiet work of Elohim the Ruach HaKodesh in our hearts. The stones were all cut to the exact size needed and fitted exactly into place, as each believer in the Kehilla. Inside, the stones were plastered with silver (1 Chronicles 29:3-5). The quantity of silver needed was 356 tons. This speaks of our great Redemption. The silver was then overlaid with beautiful cedar wood (1 Kings 6:15). This speaks to us of the excellence of the Moshiach, for "His countenance is as Lebanon, excellent as the cedars" (Songs of Sons 5:15). The cedar was carved to enhance this beauty. Our Adonai Yeshua Ha Moshiach is the "Master of glory" and His beauty should be reflected by us in all our ways. The cedar was then overlaid with gold (1 Kings 6:22). In the Holiest alone, 30 tons of gold was used. The nails were also of gold and the sum of them as 21/2 tons. The gold came from "Parvaim (2 Chron 3:6) and was renowned for its excellence. is a symbol of the execution stake of Moshiach which is central to all of Elohim's plans and purposes. We can say with Shaul, "Elohim forbid that I should glory, save in the execution stake of our Adonai Yeshua Ha Moshiach. The first sight through the open way into the inner court ws the great altar of brass. Its length and breadth were 20 cubits and height 10 cubits. These are the same dimensions as the Holiest, teaching us that the Man of Calvary is now the Man in the Shekinah. Steps led up every side of the altar of in Ezekiel's Mikdash. At the dedication of the HaMikdash, Shlomo offered 22,000 oxen and 120,000 sheep (1 Kings8:63. The altar was " too little to receive them" This emphasises the greatness of the Master's sacrifice at execution stake. Made of copper it was very large -5 cubits high, 10 cubits diameter and 30 cubits in cirumference. It ws 9 inches thick, weighed 33 tons and held 22,500 gallons of water when full and 15,000 gallons when in use. its brim ws curved out like a lotus flower and an it was carved with knops an flowers . The purpose of this vessel was to enable the Kohenim to wash themselves clean of all defilement before they entered into the Holy Place. Its great capacity teaches the "unlimited supply" of cleansing for Elohim's people today in the "washing of the water by the Word (Eph 5:26,27). The Sea stood on 12 oxen which were divided into sets of three and placed to face north, south, east and west and correspond to the 12 Tribes of Yisrael. They were hollow and the water of the Sea ran through their mouths to allow for priestly washing. This reminds us of Yochanan 7:38, 39 where Adonay said on the great day of the feast "he that believeth on me ,as the Scripture hath said, out of his belly shall flow rivers of living water" in the oxen we learn the lesson of being "strong to labour" ( Tehillim 144:14) and to uphold the things of Elohim. So the Sea brings thoughts of greatness, fulness and strength. There were 10 circular Lavers of brass, 5 on either side of the Court, engraved with lions, oxen and cherubim. Each helod 300 gallons of water and their purpose was to wash the pieces of the burnt offering sacrifices ( in prarticular the inwards and the legs). This cleansing spoke of the sessential purity of Adonay Yeshua Moshiach as the Sacrifice at Execution Stake. In Hebrews 9:14 we read, "He offered Himself with spot to Elohim"
The goldens walls garnished with precious stones must have shone in dazzling magnificence in the light of the 10 Menorah. There 5 on each side of the Holy Place. Each had 7 lamps giving a total of 70 shining lights. No measurements or detailed are given, (see 2 Chronicles 4:21; 1 Kings 7:49). The Menorah are symbolic of the "truth as it is in Yeshua" (Eph 4:21). YHWH embodied all the fulness and expression of truth. There were also "Menorah of Silver (1 Chron 28:15) but these were probably used in the side chambers by the Levites. Elements of Mitzvot, Lavers, Menorah & tables - 10 denotes the Believer's responsibility before Elohim and men. This was the golden altar which stood before the Parokhet (Veil. Made of cedar wood and gold it symbolised the excellence and glory of the Ascended Moshiach who "ever Liveth". The Kohen HaGadol burnt incense upon it morning and evening speaks of Adonay as our KOHEN HAGODAL and his Ministry of intercession. "to all our prayers and praises" Moshiach Yeshua adds His sweet perfume." made of Olive wood (beauty) and overlaid with gold (Shekinah). They were 10 cubits high and the spread of their wings covered the width of the Sanctuary above Ha ARON and their faces turned inwards gazing upon the Shekinah glory. When Adam and Eve were ban from the Garden of Eden, Cherubim were sent to guard "the way of the tree of life" and also they are guardians of the Shekinah of Elohim. This rested upon Ha ARON and was of "pure gold" (Shemot 25:17). The extraordinary thing about the Mercy Seat was its name, because it was really a lid. 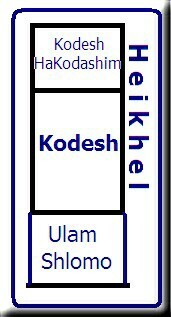 The absence of a seat, among both the Mishkan and HaMikdash furniture is because there was no need of one. The Kohenim work was never finished. They went on ministering until he was relieved. We see Moshiach Yeshua alone could say "it is finished"
If My people who bear My Name, will humble themselves, pray, seek my face and turn from their evil ways, I will hear from heaven, forgive their sin and heal their land. Shlomo was building his own house thirteen years, and he finished all his house. For he built the house of the forest of Levanon; the length of it was one hundred cubits, and the breadth of it fifty cubits, and the height of it thirty cubits, on four rows of cedar pillars, with cedar beams on the pillars. It was covered with cedar above over the forty-five beams, that were on the pillars; fifteen in a row. He made the porch of pillars; the length of it was fifty cubits, and the breadth of it thirty cubits; and a porch before them; and pillars and a threshold before them. His house where he was to dwell, the other court within the porch, was of the like work. He made also a house for Par`oh's daughter (whom Shlomo had taken as wife), like this porch. All these were of costly stones, even of hewn stone, according to measure, sawed with saws, inside and outside, even from the foundation to the coping, and so on the outside to the great court. The foundation was of costly stones, even great stones, stones of ten cubits, and stones of eight cubits. Above were costly stones, even hewn stone, according to measure, and cedar-wood. The great court round about had three courses of hewn stone, and a course of cedar beams; like as the inner court of the house of Adonay, and the porch of the house. King Shlomo sent and fetched Hiram out of Tzor. He was the son of a widow of the tribe of Naftali, and his father was a man of Tzor, a worker in brass; and he was filled with wisdom and understanding and skill, to work all works in brass. He came to king Shlomo, and performed all his work. He made two capitals of molten brass, to set on the tops of the pillars: the height of the one capital was five cubits, and the height of the other capital was five cubits. There were nets of checker-work, and wreaths of chain-work, for the capitals which were on the top of the pillars; seven for the one capital, and seven for the other capital. So he made the pillars; and there were two rows round about on the one network, to cover the capitals that were on the top of the pillars: and so did he for the other capital. The capitals that were on the top of the pillars in the porch were of lily-work, four cubits. There were capitals above also on the two pillars, close by the belly which was beside the network: and the pomegranates were two hundred, in rows round about on the other capital. He set up the pillars at the porch of the temple: and he set up the right pillar, and called the name of it Yakhin; and he set up the left pillar, and called the name of it Bo`az. On the top of the pillars was lily-work: so was the work of the pillars finished. He made the molten sea of ten cubits from brim to brim, round in compass, and the height of it was five cubits; and a line of thirty cubits compassed it round about. Under the brim of it round about there were buds which did compass it, for ten cubits, compassing the sea round about: the buds were in two rows, cast when it was cast. It was a handbreadth thick: and the brim of it was worked like the brim of a cup, like the flower of a lily: it held two thousand baths. He made the ten bases of brass; four cubits was the length of one base, and four cubits the breadth of it, and three cubits the height of it. and on the panels that were between the ledges were lions, oxen, and Keruvim; and on the ledges there was a pedestal above; and beneath the lions and oxen were wreaths of hanging work. Every base had four brazen wheels, and axles of brass; and the four feet of it had supports: beneath the basin were the supports molten, with wreaths at the side of each. The mouth of it within the capital and above was a cubit: and the mouth of it was round after the work of a pedestal, a cubit and a half; and also on the mouth of it were engravings, and their panels were foursquare, not round. The work of the wheels was like the work of a chariot wheel: their axles, and their rims, and their spokes, and their naves, were all molten. There were four supports at the four corners of each base: the supports of it were of the base itself. In the top of the base was there a round compass half a cubit high; and on the top of the base the stays of it and the panels of it were of the same. On the plates of the stays of it, and on the panels of it, he engraved Keruvim, lions, and palm trees, according to the space of each, with wreaths round about. He made ten basins of brass: one basin contained forty baths; and every basin was four cubits; and on very one of the ten bases one basin. He set the bases, five on the right side of the house, and five on the left side of the house: and he set the sea on the right side of the house eastward, toward the south. and the pots, and the shovels, and the basins: even all these vessels, which Hiram made for king Shlomo, in the house of Adonay, were of burnished brass. In the plain of the Yarden did the king cast them, in the clay ground between Sukkot and Tzaretan. Shlomo left all the vessels unweighed, because they were exceeding many: the weight of the brass could not be found out. and the cups, and the snuffers, and the basins, and the spoons, and the fire pans, of pure gold; and the hinges, both for the doors of the inner house, the most holy place, and for the doors of the house, to wit, of the temple, of gold. Thus all the work that king Shlomo worked in the house of Adonay was finished. Shlomo brought in the things which David his father had dedicated, even the silver, and the gold, and the vessels, and put them in the treasuries of the house of Adonay.